We recently got a pair of complimentary Bucket Slings courtesy of the Circus Company which we are doing our best to wear out using them around the farm. The bucket sling is like a bucket handle on performance-enhancing steroids. The version pictured here is capable of supporting loads up to 200 pounds. The Circus Company developed these to meet some of the extreme physical demands put on buckets by heavy industry, farms, brewhouses and large animal operations. So far at the farm, we’ve found uses for them in caring for our chicken flock and in safely transporting heavy vats of beer and wine. 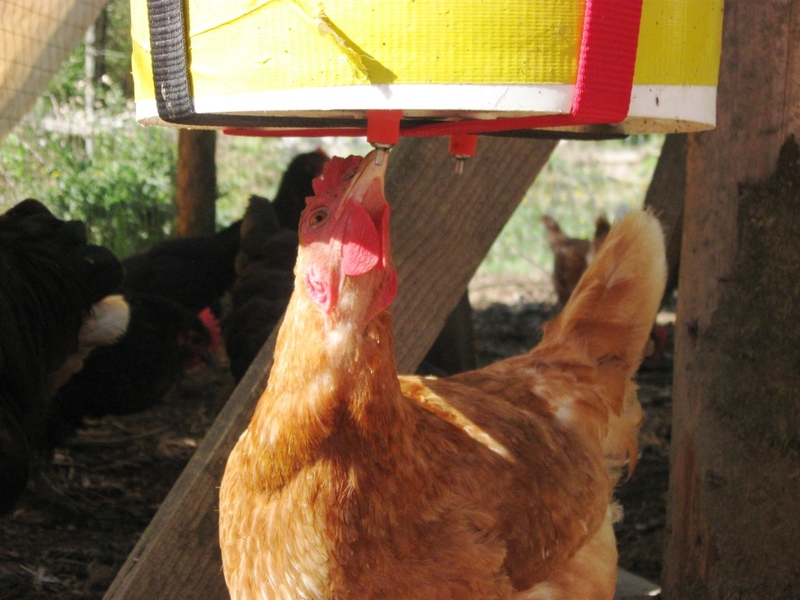 The handles on our homemade chicken waterers are starting to break. They don’t seem to be really designed to hold a full bucket for weeks at a time, which is what we’ve been demanding from them. Using the Bucket Sling to support our broken water containers means we don’t have to keep replacing waterers whenever some part of the handle goes bad. We’ve also found to our surprise that the Bucket Sling doesn’t distort the sides of the bucket into an ellipse, which happens when using just the stock handle. 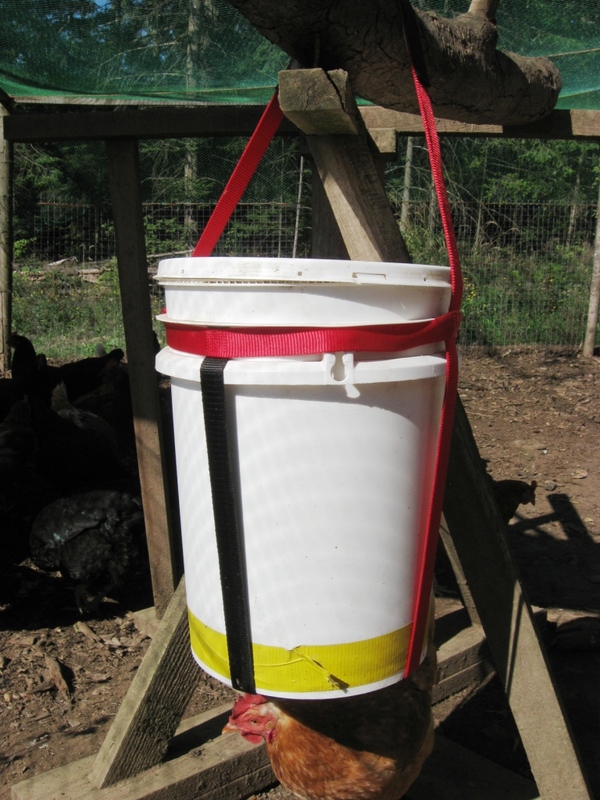 Look at the following two pictures to see how the Sling lets the bucket hold its shape while the plastic handle distorts it. 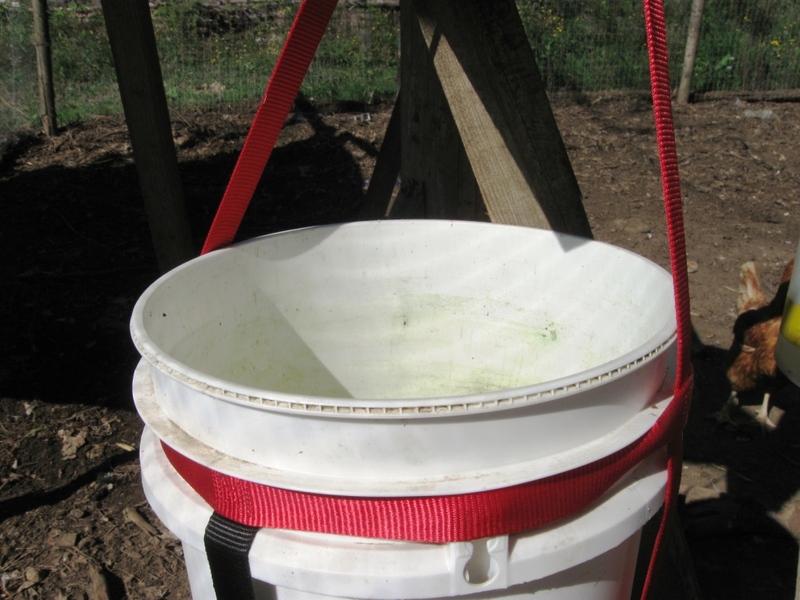 Bucket sling is better for keeping the top of the bucket round so (distorted) so that the lid can be put back. So the lid doesn’t pop off. 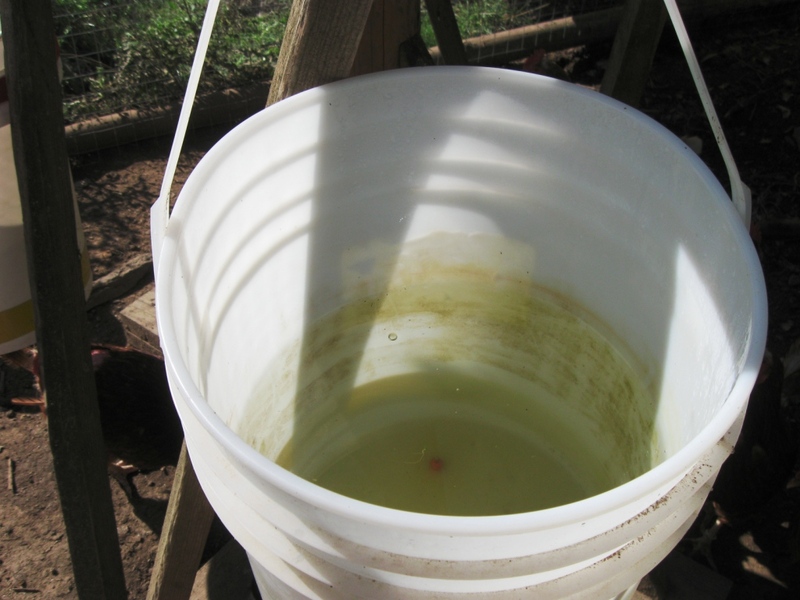 The lid is important for our particular use for the bucket sling because chickens will poop in their own water otherwise. Home Brewers are already using Bucket Sling for hoisting heavy wort up when siphoning into the next stage of the brewing process. 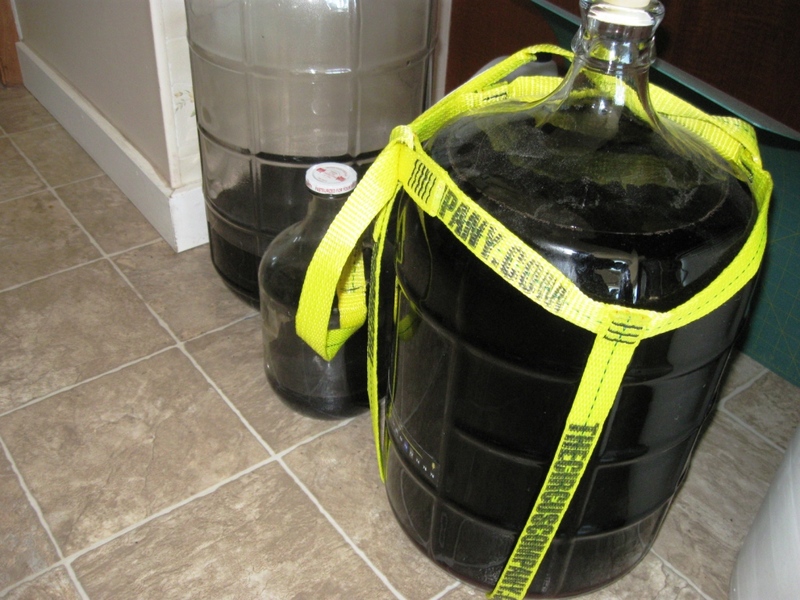 The sling makes a great carboy carrier because it tightens automatically around its load and balances itself perfectly. Here I am hoisting up 6 gallons of blackberry wine. Using the Sling feels much more stable than trying to lift a carboy up with just your hands. 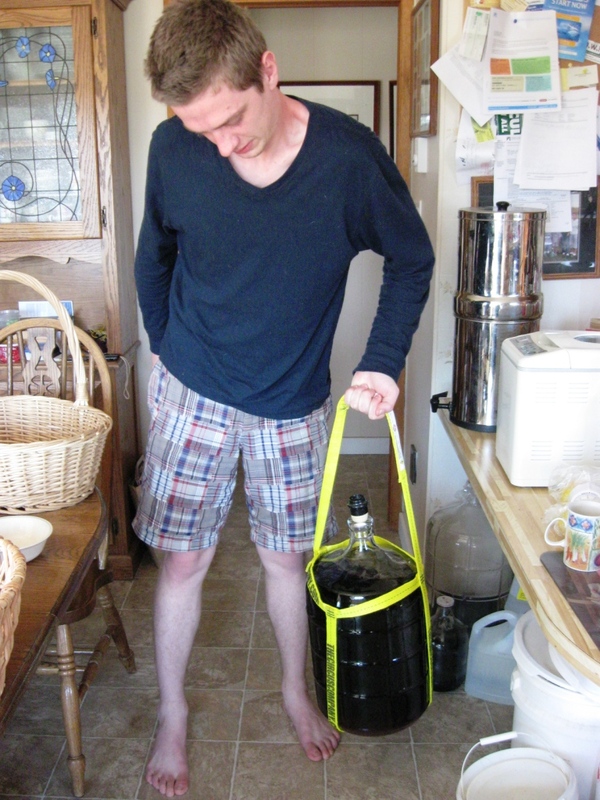 If your arms are burly you could even lift a full carboy with one hand. 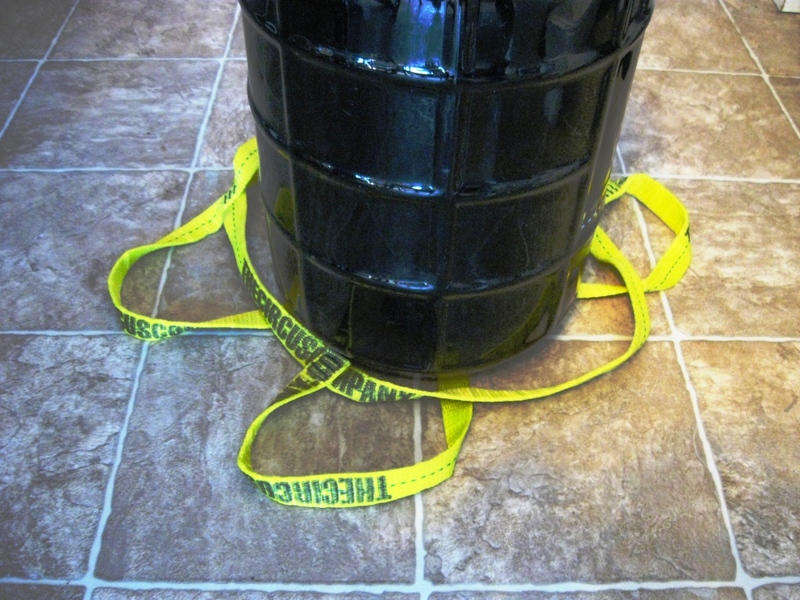 The bucket sling also makes it possible to put the weight of the carboy over your shoulder like a messenger bag, but I’ve found that the liquid sloshes around too much to make this practical. Attaching the strap onto the carboy is easy, we just lay the sling on the ground, then rolled the carboy into the middle – no lifting was necessary. The Bucket Sling have held up well to some summer tasks. Over the next year we have even more planned. The pigs are coming soon, the new building is going up, and repairs are constant. Watch this post in the coming year for more about the life of our Bucket Slings. The Bucket Sling is a relatively recent invention and I’m not aware of any retail stores that sell the Bucket Sling. 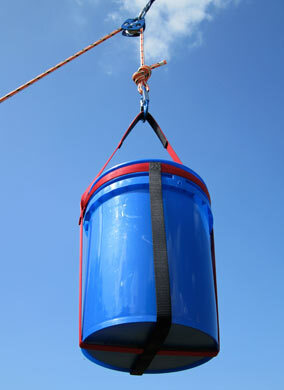 But you can order the standard 200 lb capacity bucket sling on Amazon if you’re interested in trying one out yourself. Thanks again to Dan from the Circus Company for letting us test a couple out! I can only imagine how easy these make holding a bucket yourself. Compared to the handles I’ve used in the past, they always feel as though any second they can break. These, at least in the short run can seem to handle heavier weights, just not in the long run. Thanks for the info! That sling system looks sketchy with the carboy. If you want a good strap system that cant fall off that also blocks light check out the All-in-One Carboy Covers at http://www.carboy.net I cant imagine brewing without one. I use one of these carboy covers from Carboy.net as well. Pretty amazing design, way better than those cheap brew haulers. Get one of these and you’ll never go back!! Cheers!